Beauvais : In front of the main exit door. About shuttle service: Your pick-up will be scheduled according to your flight's actual arrival, allowing for time to pass through baggage claim and customs. Select the pick up you need : cdg terminal 1, 2 or 3 - Orly airport terminal West or South and Beauvais BVA and access the booking page. It is up to you whether you want to tip the driver or not. If you are happy with the service he gave you, it is customary to tip between 5 to 10%. How many stops does the shared shuttle van make ? The number of stops is depending on operators however the van should normally do maximum three stops after your pick up in Paris. When you arrive at CDG or Orly the van generally takes less people and stops maximum twice before you are dropped off. Be sure that in each company dispatchers do their best to get you to your destination in the less possible time. 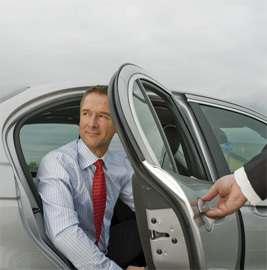 Private taxi private service is also available from the 3 airports serving Paris : Beauvais, Orly and Roissy to any destinations in the city center or Disneyland. 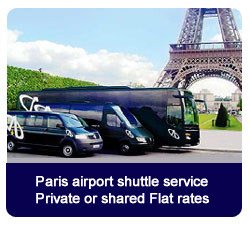 For more information about transportation services please select the airport of your choice.